Who needs glasses? What do they need them for? When did I first need glasses? 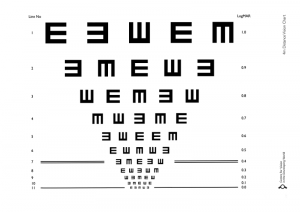 I was 12 years old when I first looked at an eye chart (see below). It was not part of a formal eye test so nobody else noticed that I had to squint to read the smallest letters. I noticed, though, and afterwards I realised that sometimes I had to squint to read road signs. But I did not have a formal diagnosis or a prescription and I certainly did not wear glasses. At that point I must have had some refractive error, probably more than one dioptre of myopia. Did I need glasses? An eye chart with the optotype “E” pointing in different directions, for people who may be illiterate or use a different alphabet and are thus unable easily to identify Latin characters. The optotypes decrease in size in each line; the lowest line from which optotypes can be reliably identified by a person at a given distance from the chart defines that person’s visual acuity. About six months later, I started at a new school and the nurse carried out a quick visual acuity screening. I could not read the smallest letters and I was told to go for an eye test. My mother took me to an optometrist, who carried out a refraction and gave me my first prescription for myopia: -1.25D in the right eye and -1.5D in the left eye (I was also prescribed 0.5D of cylinder in each eye for astigmatism). I received my first pair of glasses. I had never previously paid much attention when other kids wore glasses but now I felt embarrassed and I wore them only in class and only while I needed to read something on the blackboard – the rest of the time they sat on my desk. Outside class, I wore them only at the cinema. Later I started to play tennis competitively and found I was better able to return serve if I wore my glasses – though I could still play without glasses much of the time. Did I need glasses? It is conventional to define the need for glasses in terms of a given refractive error (the optical power specified on an optometrist’s prescription) or visual acuity: the smallest letters on an eye chart that I can reliably resolve – often specified as a fraction, e.g. 20/20 (also written as 6/6), the standard to which an optometrist hopes to correct most patients; or 20/40 (6/12), the minimum legal standard to pass a driving test in many countries. But what I will argue here is that a given acuity standard only makes sense within a particular functional context. The fact that there is a driving sight test is a clue. I need a visual acuity of at least 20/40 to drive safely, but with that acuity I would struggle to read the smaller letters on the blackboard from the back of a classroom. So in class, I need an acuity of 20/25, say. The functional context – what I am trying to do – determines how clearly I need to be able to see and therefore whether I need glasses. At any given time, whether I need glasses depends on the nature of my work and leisure activities – am I in school, do I drive a car, do I like to be able to see the facial expression of someone standing across the room from me at a social event? I suggest that there is an essentially subjective aspect to whether a given individual needs glasses, in addition to the objective fact of their refractive error. In some circumstances, public policy overrides subjective preference: the law requires you to wear glasses to achieve a certain minimum acuity when driving, whatever your subjective preference, in order to protect other road users (on the basis that poor visual acuity increases the risk of a road traffic accident). Similarly, there is, I suggest, a moral imperative to ensure that children in school wear the glasses they need to read everything on the blackboard in order to get the full benefit of their education – even if they hate wearing glasses and would rather not. But beyond these cases, we need to recognise that different functional contexts and subjective preferences will set different thresholds of refractive error or visual acuity beyond which there is a need for glasses (or contact lenses or refractive surgery, in parts of the world where those options are available). Even the relation between refractive error (e.g. -2 D) and visual acuity (e.g. 20/60) is context-dependent: the illustration below shows how the same refractive error – in this case -2 D, about my degree of myopia today – gives very different visual acuity in different light levels. Below left, with good illumination, the pupil diameter is 3 mm and the image relatively sharp; below right, in poor light, the pupil diameter expands to 8 mm so that enough light reaches the retina to form an image, but the greater effect of aberrations (because the optical system of the eye is not perfect) produces a more blurred image. It is not just visual acuity that determines how well we can function in a given context. Field of vision is also important. For instance, when driving it can be more important to have good peripheral vision than to be able to see clearly straight ahead. What a pair of glasses needs to be – and whether glasses are needed at all – depends on what the person is trying to do. In conclusion, when we talk about the need for glasses, we should pay attention to the functional context. It is reasonable to claim that all schoolchildren and all drivers need glasses if they would not otherwise have good visual acuity. What is good enough acuity depends on the task at hand. It may also be reasonable to claim that all presbyopes (older adults who can no longer focus on near objects) need glasses – at least if they want to be able to read or use a phone. But I suggest we should be careful about setting more or less arbitrary criteria for needing glasses in terms of refractive error or visual acuity. Need depends on functional context. This is the second in a series of articles by Chris Wray on the problem of lack of access to glasses in the developing world. Next: How many people need glasses but don’t have them?